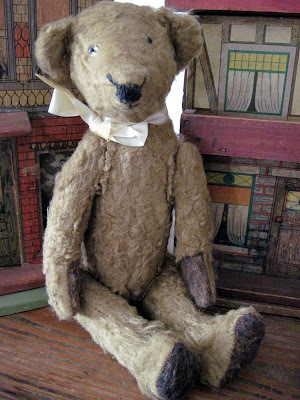 This quirky antique teddy bear is 12 inches tall, made from an unusual cotton batting type fabric. His features include a very strange nose, tiny eyes, and one foot pad which appears to have been put on upside down. He's odd, but adorable. I've never seen another like him, so I can only guess as to his age and nationality...maybe American or English circa one of the World Wars? 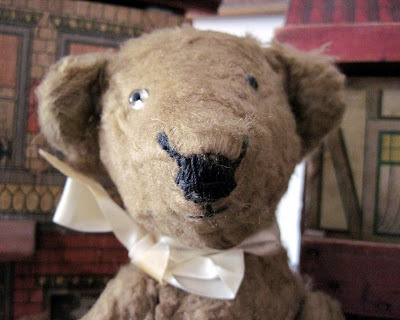 I've seen the octagonal nose once on an old English bear, and (much smaller) upward stitches also on English teds, while the side-placed ears are found on American and English varieties. This type of fabric was typically used during wartime shortages of wool, which was being used for soldiers' uniforms and so couldn't be made into mohair for bears. If anyone has a similar ted, I'd love to see him (or her) and compare notes! This is his original nose and mouth stitching. especially combined with the beady little eyes. He looks quite dashing with that mustache. Hi Siobhan and welcome! Glad you're enjoying the blog. I feel the same way about old toys: they do take you back in time, imagining the children who played with them so long ago. Hope you'll see lots more here that you like! Hi there, thanks for the tip: I have that book, and will take a look! Glad you're enjoying the blog!